The Pinball Wizard was a DC Comics villain. He didn’t last very long, only one issue of The Green Arrow. 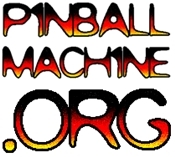 His back-story is hilariously classic: he was a pinball manufacturer put out of business by video games, and along with two other guys who were put out of business by advancing technology, they decided to put on funny costumes and cause bad stuff. Shafts and Balls… pretty good Jonny!